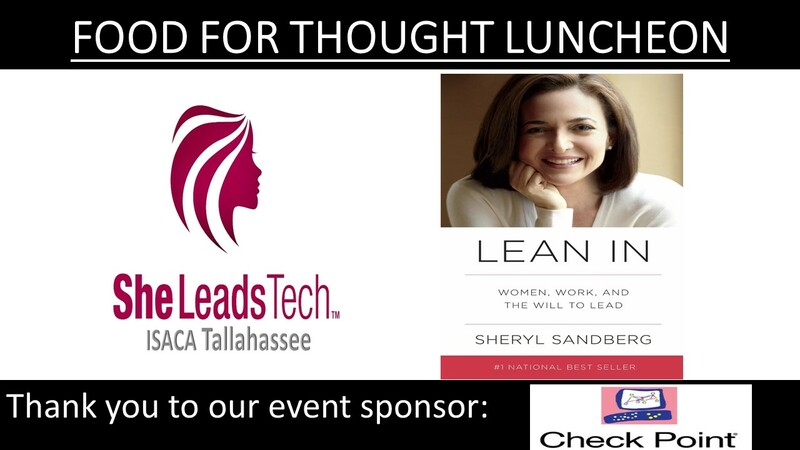 You are invited to the SheLeadsTech's Food for Thought Luncheon, where we will discuss themes from the book "Lean In: Women, Work, and the Will to Lead" by Sheryl Sandberg. A complimentary lunch will be provided to all attendees during this free event. In Lean In, Sheryl Sandberg reignited the conversation around women in the workplace. Sandberg is chief operating officer of Facebook and coauthor of Option B with Adam Grant. In 2010, she gave an electrifying TED talk in which she described how women unintentionally hold themselves back in their careers. Her talk, which has been viewed more than six million times, encouraged women to “sit at the table,” seek challenges, take risks, and pursue their goals with gusto. Although we encourage you to read (or listen to) the book in advance, you will still be able to actively participate in the discussions if you have not read the book. If you were not one of the lucky 5 winners of a free book during the recent SheLeadsTech networking event, you can pick up a copy from any bookstore or order online from retailers such as Amazon. All SheLeadsTech events are open to both women and men and the discussion will include topics that will help both grow personally and professionally. *ISACA Tallahassee Events CPE are recognized credits for individuals certified as CISA, CISM, CRISC and CGEIT professionals.